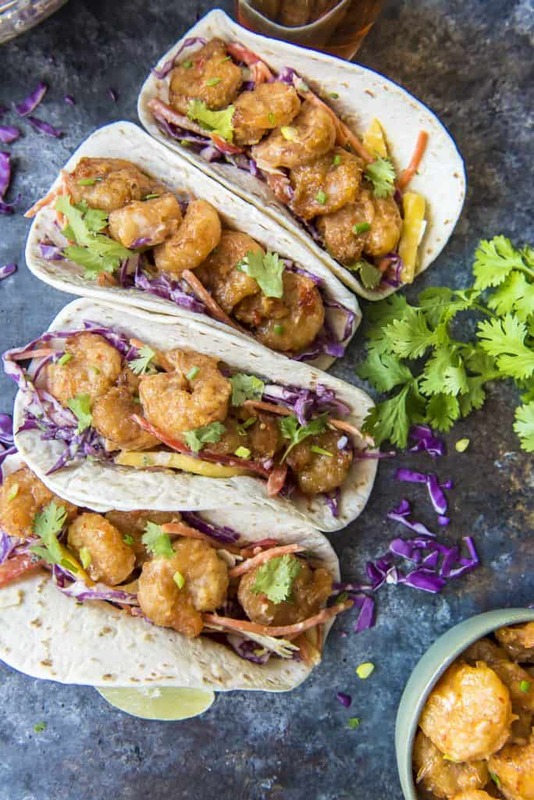 These Bang Bang Shrimp Tacos are where the appetizer meets dinner! 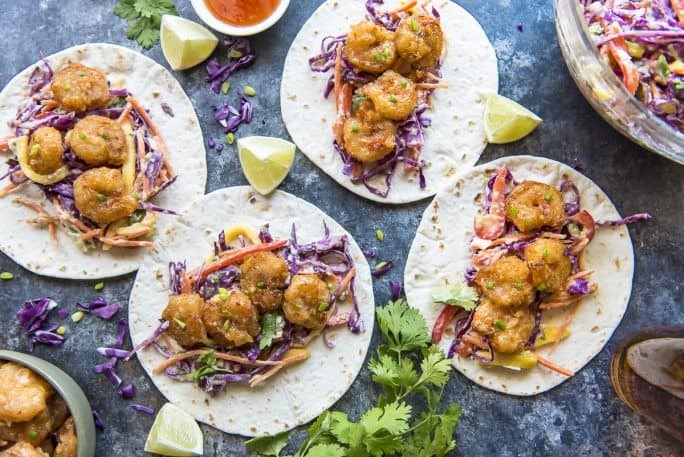 Crispy, spicy copycat Bang Bang Shrimp get all wrapped up in your favorite tortillas with a sweet and tangy coconut mango slaw for a flavor explosion that’s ready to devour in less than an hour. Who wants to make Friday night tacos a thing?! Honestly, why is Tuesday so special, anyway? I say every day of the week should be equal opportunity taco night. Especially when the tacos involve spicy crunchy shrimp and the best damn slaw in the world. Let’s talk shrimp tacos, shall we? Are you a flour or corn tortilla fan? I almost feel like that should be a required discussion question on a first date. Flour and corn people are on completely opposite sides of the food spectrum. I’m not saying tortilla preference is a deal breaker in a relationship, but – it might be. As for me? I’m a flour tortilla girl. I really try to like corn tortillas…I do. Depending on the taco, I can kind of appreciate them, but I’m ultimately going to choose the flour option if I’m given one. Shrimp don’t discriminate, though. They taste amazing on both, so feel free to use your fave when you make these! Bang Bang Shrimp were made for tacos. The crispy, spicy shrimp appetizer, made famous by Bonefish Grill, has hundreds if not thousands of copycat recipes online. 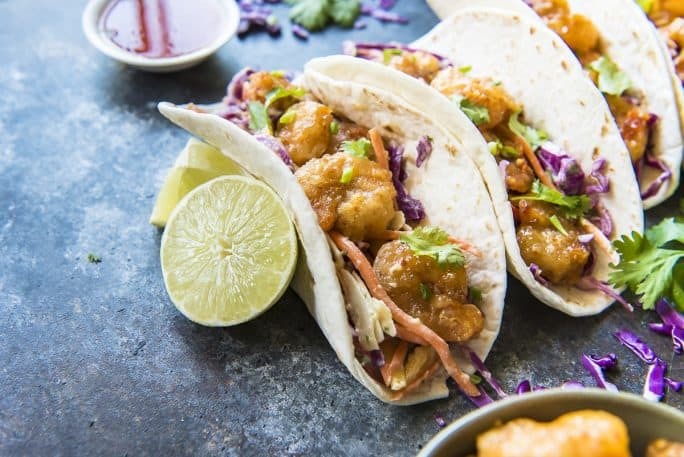 These bang bang shrimp tacos may not be an exact replica – but they are completely scrumptious in their own right. The heat-to-sweet factor in this shrimp taco recipe is easy to adjust based on your preferences. Following the recipe as written will give you a good balance of nice spice. When I make them again, I’m planning on bumping up the sriracha for even more bang. All spicy shrimp tacos need a super easy cool slaw. The slaw may well be my favorite part of this taco recipe…I actually ended up eating the leftovers by themselves. I took elements of a classic slaw (cabbage and carrots) and worked in some sweet mango and coconut – and it’s a completely magical combo. 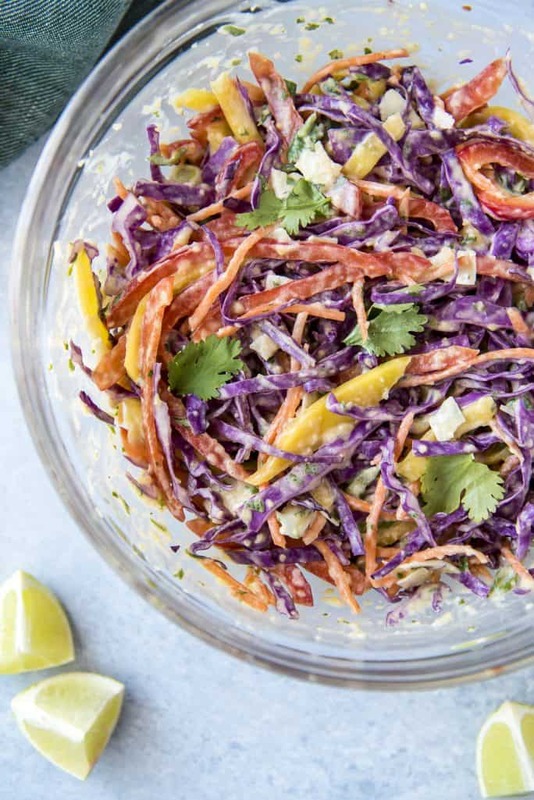 Not only are there raw mango slices and coconut flakes IN the slaw – the liquid base is made of coconut milk and even more pureed mango, with cilantro and lime thrown in for good measure. There’s no mayonnaise or dairy in this yummy side dish, allowing for the extra calories in the fried shrimp. Also meaning you’ll probably be eating this slaw on everything this summer. I know I will be. 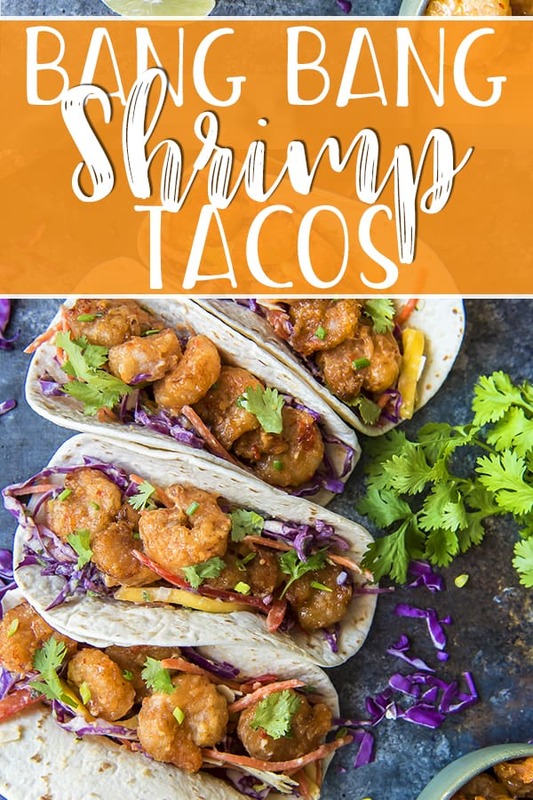 How do you make shrimp tacos? In a blender, add coconut milk, mango puree, lime juice, and salt. Blend until well combined, then add the cilantro leaves and pulse until they are mostly shredded. Set aside. Combine the cabbage, carrots, bell pepper, mango, coconut, and green onion in a large bowl. Pour the coconut-mango sauce over the vegetables and toss, massaging with your hands to incorporate. Season with salt and pepper if desired, then chill in the refrigerator for at least 30 minutes, making the shrimp in the meantime. In a small bowl, whisk together the mayonnaise and chili sauces. Set aside. When the oil is heated to 375 degrees, cook the shrimp in batches for 2-3 minutes on each side (depending on size), flipping with tongs. Use the tongs to quickly but carefully transfer the fried shrimp to a paper towel-lined plate briefly, then add them to the mayo-chili sauce bowl and toss to coat. Transfer them to a serving bowl. Repeat the process with the remaining shrimp. Serve immediately with coconut mango slaw in flour or corn tortillas. Garnish with fresh cilantro and serve with lime wedges and additional Thai sweet chili sauce, if desired. 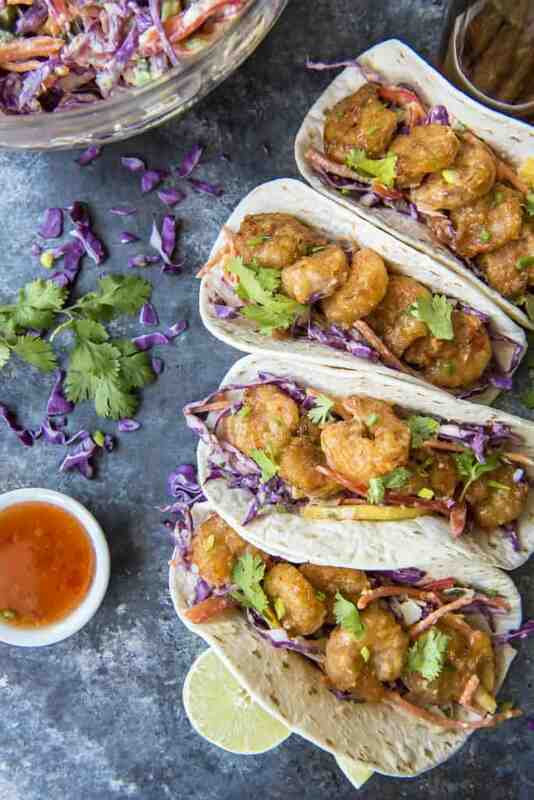 Love these bang bang shrimp tacos? Check out these other deliciously mouthwatering shrimp recipes! 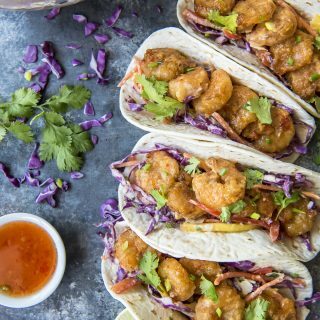 These Bang Bang Shrimp Tacos are where the appetizer meets dinner! 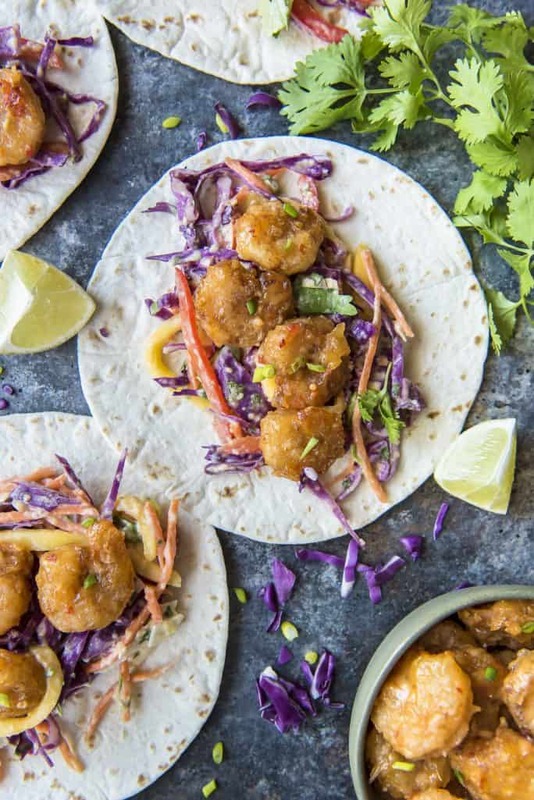 Crispy, spicy copycat Bang Bang Shrimp get all wrapped up in your favorite tortillas with a sweet and tangy coconut mango slaw for a flavor explosion that's ready to devour in less than an hour. 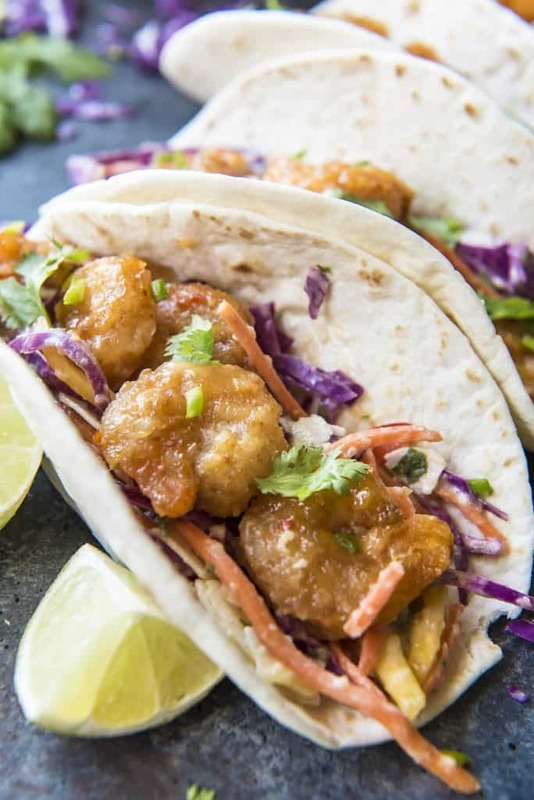 PIN THIS BANG BANG SHRIMP TACO RECIPE FOR LATER! For all the times I’ve made Bang Bang Shrimp, we inhale it too fast to eat on a taco. Next time though, totally doing that….with the mango slaw. YUM. OMG! Yes, let’s make Friday night all about tacos. Let’s make every night all about tacos!! These sound amazing!